What LiveChat Triggers and Actions are Supported? Finished Chat - Triggers when the chat is ended. New Ticket - Triggers when the ticket is created. New Visitor in Queue - Triggers when a visitor enters queue. New Chat - Triggers when the chat is started. Chat Changed - Triggers when the tag list for a particular chat was changed. 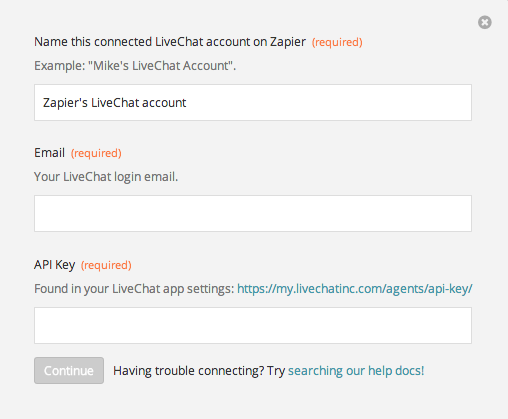 To get started with LiveChat, first click to add a LiveChat account to Zapier to be used in your zap. Once you've entered your email and API key and clicked continue, we'll test your account to make sure the connection works. If it does, you're all set! When creating a Zap powered by a LiveChat Trigger, please be sure that you are connecting an account with the admin role. Zaps using a non-admin role are able to be turned on, but they will not be triggered due to missing permissions.